Observatories too commonly make the mistake of engaging in a look-and-point philosophy, which withholds the visitors from an intimate contact to their surroundings. 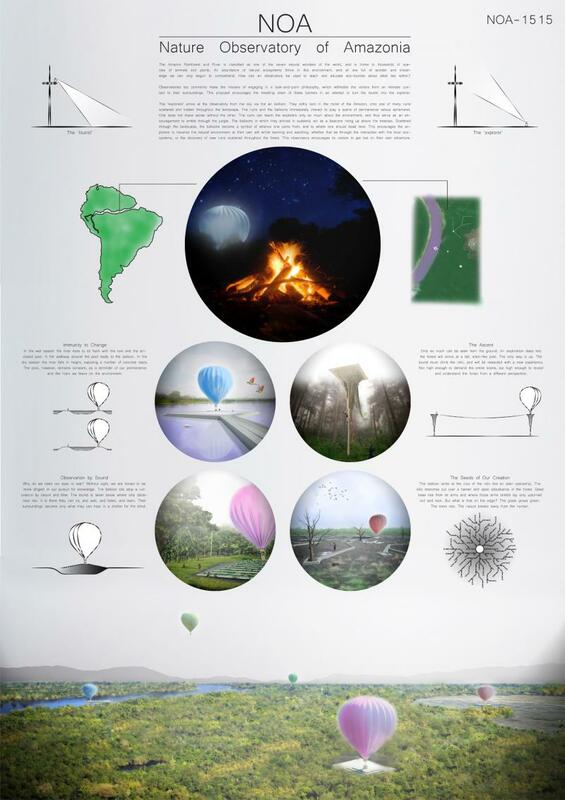 This proposal encourages the breaking down of these barriers in an attempt to turn the tourist into the explorer. The ‘explorers’ arrive at the observatory from the sky via hot air balloon. They softly land in the midst of the Amazon, onto one of many ruins scattered and hidden throughout the landscape. The ruins and the balloons immediately interact to play a scene of permanence versus ephemeral. One does not make sense without the other. The ruins can teach the explorers only so much about the environment, and thus serve as an encouragement to amble through the jungle. The balloons in which they arrived in suddenly act as a beacons rising up above the treetops. Scattered through the landscape, the balloons become a symbol of whence one came from, and to where one should head next. This encourages the explorers to traverse the natural environment at their own will whilst learning and watching, whether that be through the interaction with the local ecosystems, or the discovery of new ruins scattered throughout the forest. This observatory encourages its visitors to get lost on their own adventure.